Special designations can be valuable resources for advisors, but FAs warn heedlessly collecting them may do more harm than good. Special designations are used to show FAs have specialized knowledge in areas of focus. 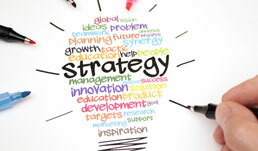 They range from the well-known designations – Certified Financial Planner (CFP), Certified Senior Advisor (CSA), Certified Retirement Financial Advisor (CRFA) — to the slightly more narrow – Certified Divorce Financial Analyst (CDFA), Certified Kingdom Advisor (CKA), and Certified Business Exit Consultant (CBEC). Attracting clients today is more challenging than ever and having areas of specialization can help FAs distinguish themselves from their peers, Kevin Dorwin, managing principal of Bingham Osborn & Scarborough, LLC, says. At Bingham Osborn & Scarborough, which advises on $4.5 billion, there are a few team members who hold certified divorce specialist and retirement planner designations, and their designations have helped recruit new clients in a couple instances, he says. While specialized designations are not valuable all the time, in some circumstances they give advice firms the edge in a close competition with other firms, he says. Special designations can also be used to beef up an FA’s specific subject knowledge, says Ben Riddick, director of Homrich Berg, which advises on $5.5 billion. And niche knowledge is becoming increasingly important as the advice industry trends towards offering more specialized services, Dorwin says. Increased competition among FAs and the growth of lower-cost solutions are also pushing advisors to build specialized knowledge and distinguish themselves to clients with specific needs, he says. Riddick particularly sees specialized designations in relation to planning for events – like divorce and retirement – being highly valued. But not all designations are created equal and Dorwin says FAs must carefully choose which they pursue. Among designations available there are two main subsets – accredited and non-accredited, says Dirk Pantone, vice president of business development at the College for Financial Planning. Accredited designations are typically more difficult to earn and maintain, and tend to have disciplinary laws for misbehaving advisors attached, he says. Non-accredited designations are free of industry rules requiring the designation meet certain standards. So, while some issuing organizations set rigorous benchmarks for the designations they appoint, others only require an annual fee. And these discrepancies make whether a governing entity has disciplinary laws essential for distinguishing between accredited and non-accredited designations, says Pantone. A decade ago some designations were used by FAs to prey on seniors and get them to buy improper investments, he says. By having an issuing organization monitor disciplinary actions – both from its own procedures and with the SEC – the designation is given more legitimacy. The regulating entity can furthermore help prevent “bad apples” from promoting themselves as specialists to clients and potential clients, he says. The SEC also warns against titles used by FAs which are simply purchased or made up to imply false expertise, or those that are merely marketing tools not granted by a regulator. Overloading on niche accredited designations can spell trouble for FAs, Pantone says. Some firms limit the number of designations FAs can display after their names and, at this point, most firms have whittled designation options for advisors down to an approved list, he says. Over-collecting designations can prove a waste of time for FAs, Riddick says. Some designations take many hours to earn and FAs allocating their time to a certification they won’t use are wasting their time and money – particularly so when “the number of the designations after an FA's name is less important than being a good advisor,” Dorwin says. Before earning a niche designation, advisors should focus on being well-developed in core fundamentals and stick to traditional designations first, such as the CFP or CFA, says Dorwin. 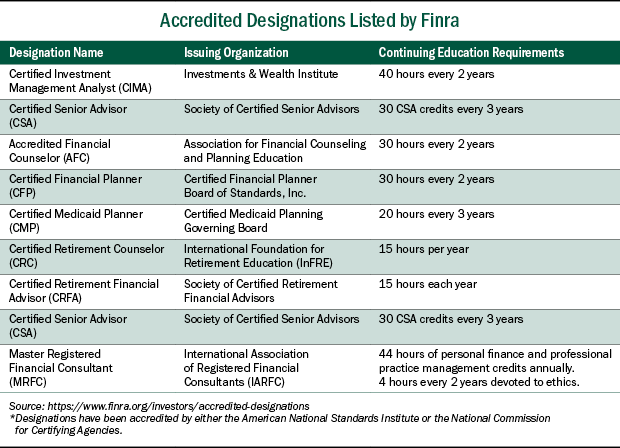 Both designations show that an advice staff is credentialed and qualified, with the CFP and CFA being a baseline for advisors and analysts, respectively, he says. How do you feel about special designations? Are they worth the time and money? Which ones aren't? Tell us in the comments section below.